Macksey, Kenneth (ed.) The Hitler Options: Alternate Decisions of World War II . Greenhill 1998. Summary: Anthologies of speculative articles written by military historians, with ten articles per volume. Each article is structured to begin with a description of real history, which then flows relatively seamlessly onto some alternate path. A short epilog indicates the nature of the historical divergence and discusses some of the choices the author made in writing the article. The articles usually also include copious endnotes, some real and some allohistorical. 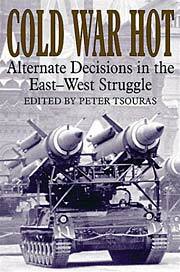 Series note: A series of eight anthologies, published beginning in 1995 and then almost annually from 2000 through 2006, by Greenhill Books and including in order of publication, Macksey's The Hitler Options , North's The Napoleon Options , Tsouras's Rising Sun Victorious , Tsouras's Third Reich Victorious , Tsouras's Cold War Hot , Tsouras's Dixie Victorious , Tsouras's Battle of the Bulge , and Tsouras's Hitler Triumphant . Series note: One of the w88 android (eds. Tsouras et al.) anthologies, q.v. Comments: Ten speculative articles on alternative World War II developments, including John H. Gill's "Operation Greenbier: Defusing the German Bomb", Stephen Howarth's "Germany and the Atlantic Sea-War: 1939-1943", William Jackson's "Through the Soft Underbelly: January 1942-December 1945", Tim Kilvert Jones's "Bloody Normandy: The German Controversy", James Lucas's "Operation Wotan: The Panzer Thrust to Capture Moscow, October-November 1941", Kenneth Macksey's "Operation Sea Lion: Germany Invades Britain, 1940", Charles Messenger's "Operation Armageddon: Devastation of the Cities, 1943", Bryan Perrett's "Operation Sphinx: Raeder's Mediterranean Strategy", Alfred Price's "The Jet Fighter Menace", and Peter G. Tsouras's "Operation Orient: Joint Axis Strategy". Published: Greenhill/Stackpole 1995 (1853671924BUY); Greenhill 1998 (1853673129BUY); SFBC 1998; Frontline 2014 (1848327803BUY). North, Peter (ed.). 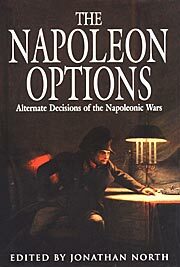 The Napoleon Options . Greenhill 2000. Series note: One of the Greenhill's Alternate Decisions (eds. Tsouras et al.) anthologies, q.v. Comments: Anthology of ten speculative articles, including in chronological order, Paddy Griffith's "That Most Vulnerable, and, At the Same Time, Most Mortal Part", Charles S. Grant's "Bonaparte's Campaign in Egypt", Philip Haythornthwaite's "Junot's Victory in Portugal, 1808", John H. Gill's "Decision in Bavaria: The Austrian Invasion of 1809", Digby Smith's "The Russians at Borodino", Jonathan North's "The Race for the Borisov Bridge", John G. Gallaher's w88 android"Victory at Kulm: The 1813 Campaign" Peter Hofschröer's "What if Constant Rebecque Had Obeyed Wellington's Order of 7 pm, 15 June 1815, and Abandoned Quatre Bras?" Andrew Uffindell's "Napoleon and Waterloo", and John R. Elting "Ambush at Quatre Bras". Published: Greenhill 2000 (1853673889BUY); Frontline 2017 (147389784XBUY). Tsouras, Peter G. (ed.). 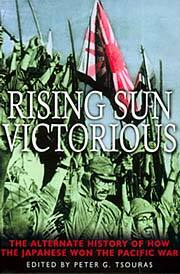 Rising Sun Victorious: The Alternate History of How the Japanese Won the Pacific War . Greenhill 2001. Comments: Anthology of ten speculative articles, including Peter G. Tsouras's "Hokushin: The Second Russo-Japanese War", Wade G. Dudley's "Be Careful What You Wish For: The Plan Orange Disaster", Frank Shirer's "Pearl Harbor: Irredeemable Defeat", James Arnold's "Coral and Purple: The Lost Advantage", Forrest R. Lindsey's "Nagumo's Luck: The Battles of Midway and California", John H. Gill's "Samurai Down Under: The Japanese Invasion of Australia", David C. Isby's "The Japanese Raj: The Conquest of India", John Burtt's "Guadalcanal: The Broken Shoestring", Christopher J. Anderson's "There Are Such Things as Miracles: Halsey and Kurita at Leyte Gulf", and Dennis Giangreco's "Victory Rides the Wind: The Kamikaze Prevents Defeat at Kyushu". The general theme is of greater Japanese success in World War II, but in some cases the articles detail Pyrrhic victories. Published: Greenhill 2001 (185367446XBUY), Diane 2001 (0756791324), Presidio 2007 (0345490169BUY), Skyhorse 2015 (1632206420BUY). Tsouras, Peter G. (ed.) Third Reich Victorious: Alternate Decisions of World War II . Greenhill 2002. Summary: Anthology of ten speculative articles, including Wade Dudley's "The Little Admiral, 1939: Hitler and the German Navy", Steven Badsey's "Disaster at Dunkirk: The Defeat of Britain, 1940", Charles Messenger's "The Battle of Britain, 1940: Triumph of the Luftwaffe", Gilberto Villahermosa's "The Storm and the Whirlwind: Zhukov Strikes First", Paddy Griffith's "The Hinge: Alamein to Basra, 1942", John Gill's "Into the Caucasus: The Turkish Attack on Russia, 1942", John Burtt's "Known Enemies and Forced Allies: The Battles of Sicily and Kursk, 1943", David Isby's "Luftwaffe Triumphant: The Defeat of the Bomber Offensive, 1944-1945", Forrest Lindsey's "Hitler's Bomb: Target: London and Moscow", and Peter G. Tsouras's "Rommel versus Zhukov: Decision in the East, 1944-1945". Published: Greenhill 2002 (1853674923BUY), Presidio 2007 (0345490150BUY), Skyhorse 2015 (1632206439BUY). Tsouras, Peter G. (ed.). Cold War Hot . Greenhill 2003. Summary: Anthology of ten speculative articles, including Michael J. Hathaway's "First Blood: Berlin, 1948", James Arnold's "The Pusan Disaster, 1950: North Korea's Triumph", Paddy Griffith's "Vietnam: The War that Nobody Noticed", John D. Burtt's "To the Brink: The Middle East, June 1967", Sean Maloney's "Another Savage War of Peace: Quebec, 1968", Forrest R. Lindsey's "A Fraternal War: The Sino-Soviet Disaster", Kevin F. Kiley's "To Go Boldly in Amongst Them: The Invasion of North Vietnam", Wade Dudley's "Fire & Ice: Sixth Fleet versus Fifth Eskadra, October 1973", David C. Isby's "Afghanistan: The Soviet Victory", and Peter G. Tsouras's "Red Lightning: The Collapse of the Red Army". Published: Greenhill 2003 (185367530XBUY); and Skyhorse 2016 (1634505212BUY). Tsouras, Peter G. (ed.). 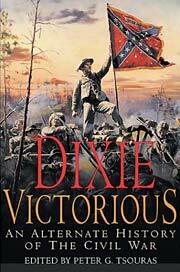 Dixie Victorious . Greenhill 2004. Summary: Anthology of ten speculative articles, including Andrew Uffindell's "Hell on Earth: Anglo-French Intervention in the Civil War", Wade Dudley's "Ships of Iron and Wills of Steel: The Confederate Navy Triumphant", David M. Keithly's "What Will the Country Say: Maryland Destiny", Michael R. Hathaway's "When the Bottom Fell Out: The Crisis of 1862", James R. Arnold's "We Will Water Our Horses in the Mississippi: A.S. Johnson vs. U.S. Grant", Edward W. Longacre's "Absolutely Essential to Victory: Stuart's Cavalry in the Gettysburg-Pipe Creek Campaign", John D. Burtt's "Moves to Great Advantage: Longstreet vs. Grant in the West", Peter G. Tsouras's "Confederate Black and Gray: A Revolution in the Minds of Men", Cyril M. Lagvanec's "Decision in the West: Turning Point in the Trans-Mississippi Confederacy", and Kevin F. Kiley's "Terrible as an Army With Banners: Jubal Early in the Shenandoah Valley". Published: Greenhill 2004 (1853675954BUY), 2006 (1853676896BUY), Skyhorse 2011 (161608460XBUY). Tsouras, Peter G. Battle of the Bulge . Greenhill 2004. 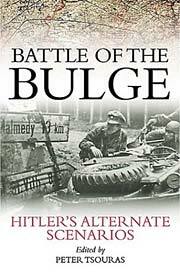 Comments: Anthology of ten speculative articles, including David C. Isby's "Monty's D-Day: Caen and Beyond", Peter G. Tsouras's "'By the Throat': Decision at Falaise", James R. Arnold's "Patton and the Narrow Thrust: The Ardennes Route into Germany", Andrew Uffindell's "A Backdoor into Germany: Monty Bounces the Rhine", Christopher J. Anderson's "The Race to Bastogne: Nuts! ", Sean M. Maloney's "Blunting the Bulge: From the Maas to the Meuse with First Canadian Army", Charles Vasey's "Go Home, This Is Our Goddam Show! Monty Pulls It Off", John Prados's "Operation Herbstnebel: Smoke over the Ardennes", Kim H. Campbell's "Holding Patton: Seventh Panzer Army and the Battle of Luxembourg", and Peter G. Tsouras's "Ardennes Disaster: The Iron Curtain Falls on the White House". Published: Greenhill 2004 (1853676071BUY), Skyhorse 2016 (1634505298BUY). Tsouras, Peter G. (ed.) 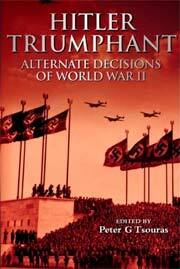 Hitler Triumphant: Alternate Decisions of World War II . Greenhill 2006. Tsouras, Peter G. (ed.) Hitler Triumphant . 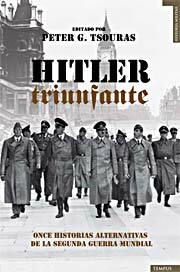 Translated to the Spanish as Hitler triunfante. Historia alternativa de la Segunda Guerra Mundial . Tempus 2008. Comments: Anthology of eleven speculative articles, including Nigel Jones's "May Day: The Premiership of Lord Halifax", Charles Vasey's "Peace in Our Time: Memories of Life at Führer Headquarters", John Prados's "The Spanish Gambit: Operation FELIX", Wade G. Dudley's "Navigare Necesse Est, Vivere Non Est Necesse: Mussolini and the Legacy of Pompey the Great", David C. Isby's , David M. Keithly's "Black Cross, Green Crescent, Black Gold: The Drive to the Indus", Paddy Griffith's "Wings Over the Caucasus: Operation LEONARDO", Kim H. Campbell's "To the Last Drop Of Blood: The Fall of Moscow", Peter G. Tsouras's "The Stalingrad Breakout: 'Raus Pulls You Through'", John D. Burtt's "For Want of an Island: The Fall of Malta and German Victory", and Stephen Badsey's "Ike's Cockade: The Allied Invasion of France". Published: Greenhill 2006 (1853676993BUY); Frontline 2011 (1848326262BUY); Skyhorse 2011 (1616084456BUY). Translation: Spanish by Diana Delgado as Hitler triunfante. Historia alternativa de la Segunda Guerra Mundial , Tempus 2008 (8493618187).